Dr. Eric Axelrode received his B.A. in economics from U.C. Santa Cruz. He received his DDS from the University of the Pacific in San Francisco. Dr. Eric completed a year of general practice residency at the Veterans Administration Hospital in Portland Oregon, treating medically compromised patients. He practiced general dentistry in Oakland and San Pablo for three years prior to completing his orthodontic residency at the University of the Pacific in San Francisco. During his residency he earned his certificate and Master of Science in Dentistry. Dr. Eric brings a unique approach in delivering excellent orthodontic care while understanding first hand the needs of the general dentist. Dr. Eric and his wife, Monica, have two children, Jean-Luc and Leah. He is a native of Orinda and graduated from Miramonte High School. After studying in various places, he wanted to return to his roots to raise a family. 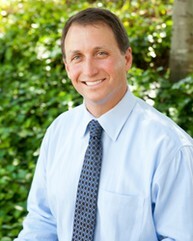 Dr. Eric and his family live in Moraga, and enjoy being part of the community both personally and professionally. He enjoys spending time with his family, mountain biking, skiing and traveling.